MetaboLight cooperates with EWB – yet again! 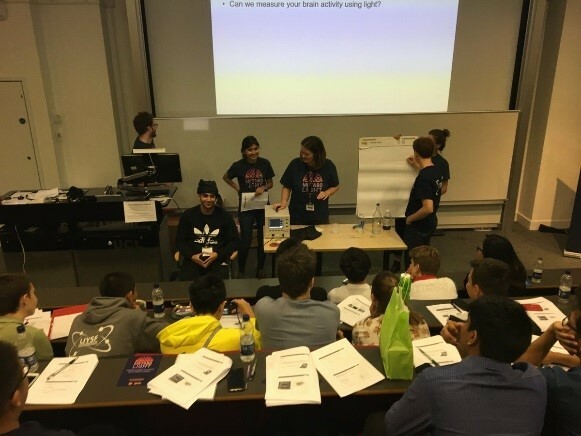 MetaboLight partnered up with EWB UCL (Engineers Without Borders University College London) for a third time and held two sessions for a total of 60 year 10 students, introducing them to near infrared spectroscopy and how we can use light to measure our brain oxygenation and metabolism! MetaboLight member Nico lead the sessions, which kicked off with an electronics session followed by a demonstration of our miniaturized hospital equipment that measures brain oxygenation and metabolism. The students were all extremely obedient and attentive, and we can respectfully say that we enjoyed teaching them as much as they enjoyed the session! We hope these activities would not only exposed them to this uprising technology, but introduce them into the world of science and perhaps grow into future leaders in STEM fields. MetaboLight cooperates with EWB again! 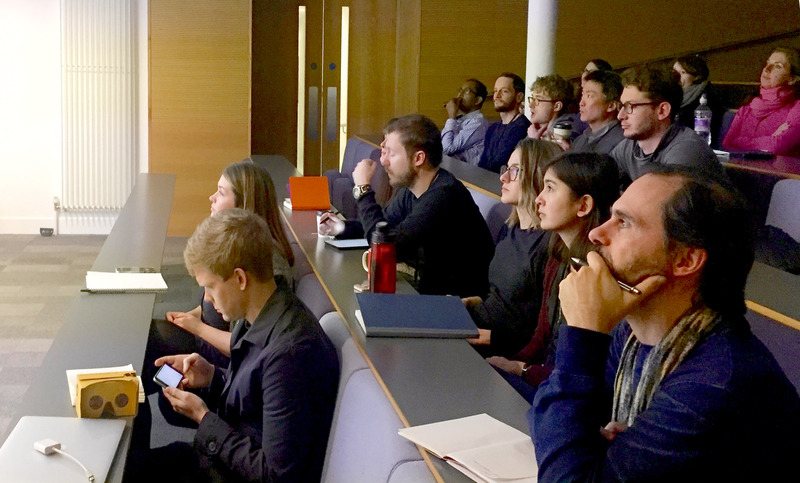 On 21st February, MetaboLight teamed up with EWB UCL (Engineers Without Borders University College London) for a second time and held a 1.5 hour long session with a group of bright young scholars interested in engineering. The students were absolutely brilliant, with alertness and attentiveness, and all 30 of them managed to build the electronic circuitry without much help from our team members! 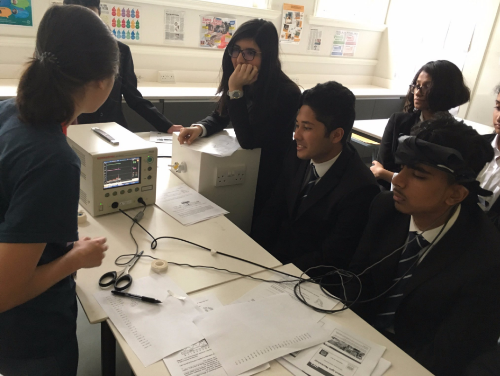 The electronics session followed up with a demonstration of our miniature hospital equipment which sparked much interest from students. Students were then given a 45 minutes Question & Answer session where they asked questions regarding university life and suggestions on how to choose a subject that is most suitable for themselves. Overall, we enjoyed the session very much, and hope to do more collaborations with EWB UCL! MetaboLight partnered up with The Brilliant Club in designing and delivering The Scholars Programme, a course that teaches students about the engineering design process, the application of physical principles to the design of machines, and how scientists interpret data. The course was really popular and ended up being delivered in 32 schools to 388 pupils, which was fantastic! 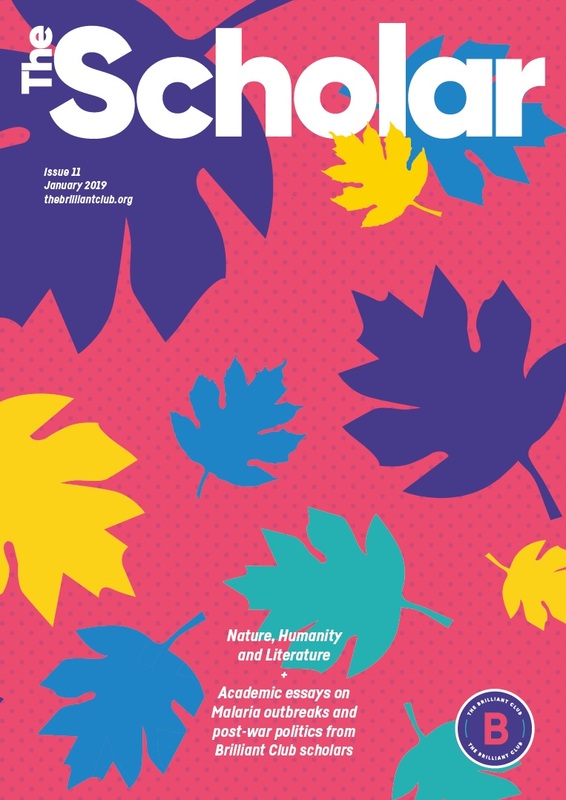 In the latest version of The Scholar, which showcases the best academic essays from pupils on The Scholars Programme, a few pupils wrote excellent articles featuring NIRS! BBC Newsround video is out! 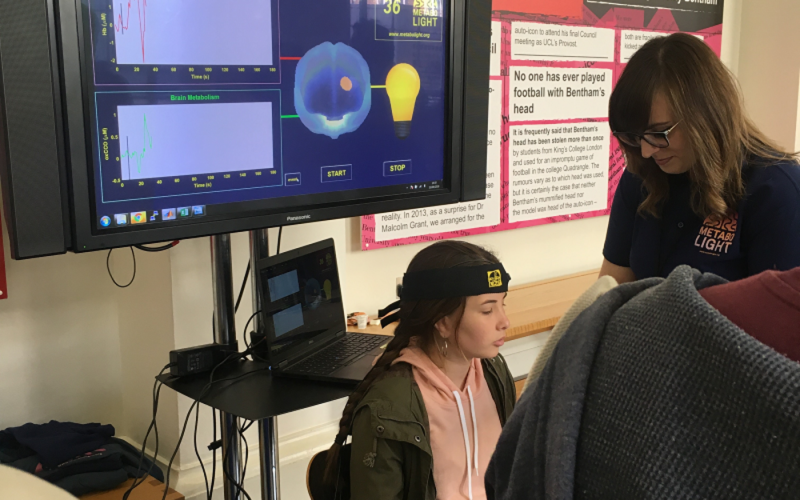 Our MetaboLight member Dr Gemma Bale met up with BBC Newsround for International Day of Women and Girls in Science, and explained how we can monitor the brain with light. If you’d like to know more about what we can do with light, and also Gemma’s take on why we need more girls in science, be sure to check out the following links! 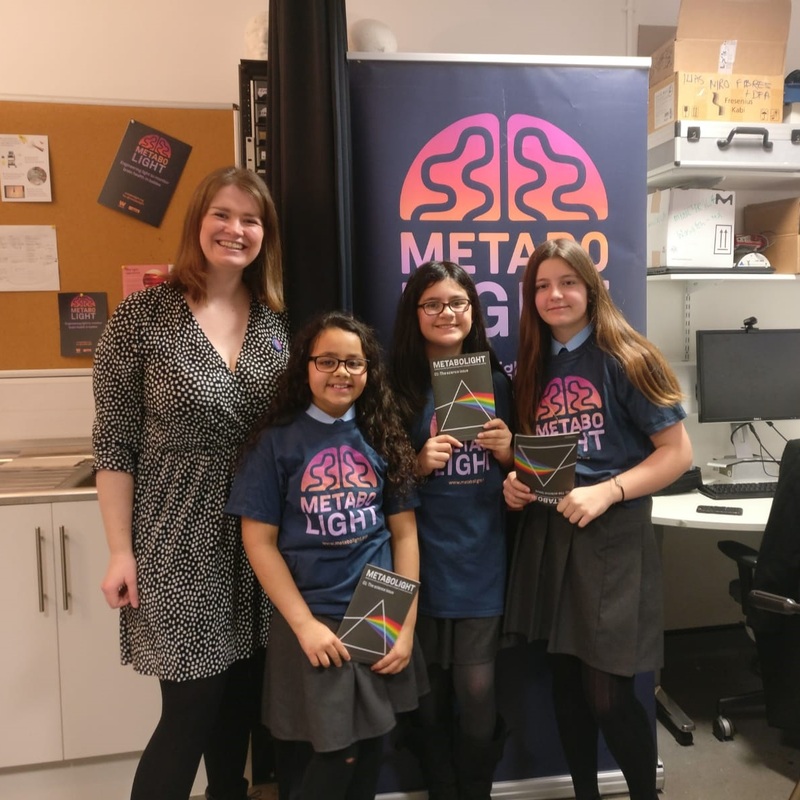 Dr Gemma Bale shared her thoughts on why we need more women in STEM and shared her knowledge on brain monitoring with three young scientists from Derwentwater Primary School this morning for BBC Newsround, right inside our MetaboLight lab! The girls were very excited, and we hope they will grow up to become three bright scientists themselves! Big Bang Fair 2018 Recap! MetaboLight looks back at the Big Bang Fair 2018 event, where we scanned 318 hands, 338 brains, and gave out more than 3000 gummy bears to explain the colours in light! Be sure to catch us at the Royal Society Summer Science Exhibition on 1-7 July 2019 at Carlton House Terrace, London! 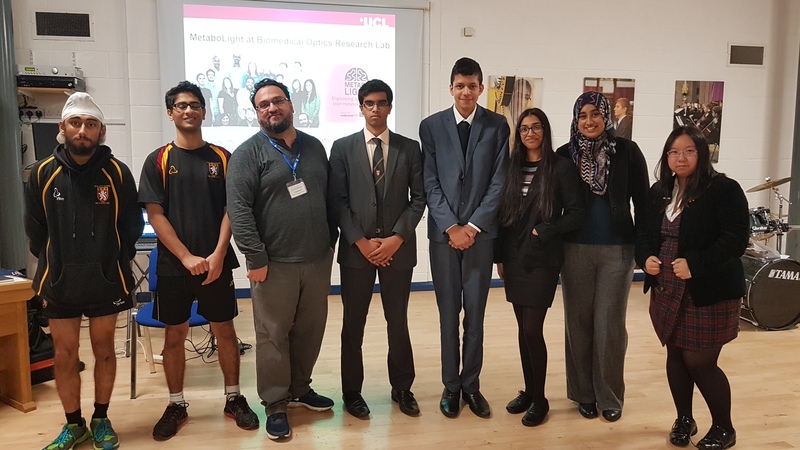 On 23rd January, MetaboLight teamed up with EWB UCL (Engineers Without Borders University College London) to hold a 3 hour long session for a group of enthusiastic year 8 students at Harris Academy Purley. The session started off with an electronics workshop, where students teamed up with their classmates to follow circuit diagrams and light up LEDs with buttons and potentiometers. Many students were extremely bright and managed to build the circuitry without help from our team! Afterwards, we introduced them to our research and demonstrated our brain scan to them. They were intrigued and excited to see the results of their brain during stimulation! Finally, we held a Question & Answer session where students asked us questions regarding entry to university and how life in university is, where we shared our personal experiences and gave advice on how to pursue what they wanted. All in all, it was a fun and enjoyable session, and we hope the students found it enjoyable too! MetaboLight team member Dr Paola Pinti has written a blog on Hello Bio talking about multidisciplinary projects and the importance of being a member of the team, and shares her experience on how we work effectively in our team of engineers and doctors. 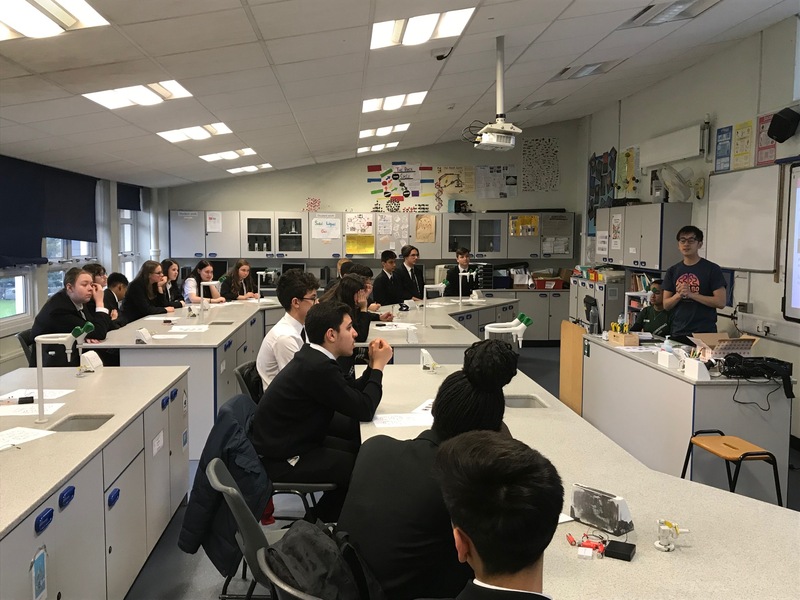 On 28th of November 2018, Dr Ilias Tachtsidis visited Bablake School in Coventry to introduce to year 7 and sixth form students MetaboLight, Medical Physics and Biomedical Engineering. This was a very engaging evening that was thoroughly enjoyed by the students. Read below the feedback that Dr Tachtsidis received. Dr Subhabrata Mitra, MetaboLight clinical member, won the Young Investigator Award in the international meeting of Neonatal Update 2018, “the science of newborn care”. 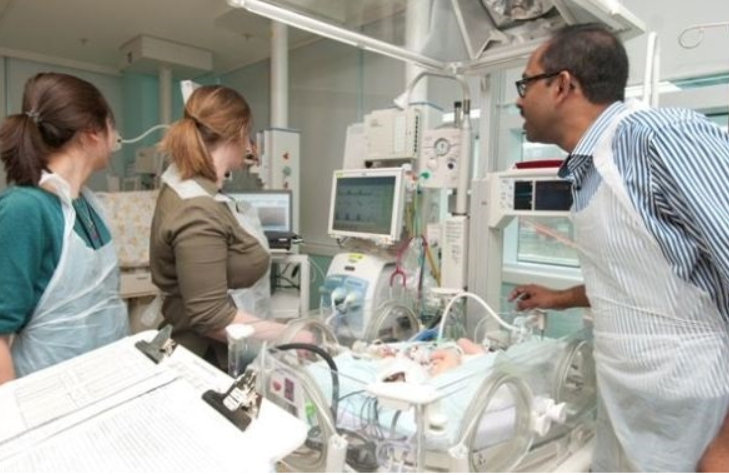 Awards are made each year to up to two outstanding young investigators for their research achievements in neonatal medicine, and at the Neonatal Update meeting they are given the opportunity to discuss the relevance of their past and future work. Dr Subhabrata Mitra introduced his research work within MetaboLight and discussed our future plans in developing advanced optical instruments to monitor the brain function and metabolism in brain injured newborns. 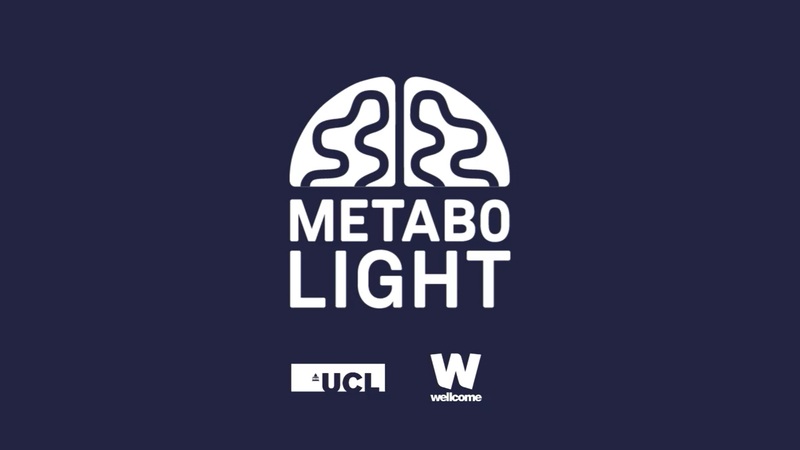 We were delighted to be invited by the UCL MedTech Society on the evening of 9 October to demonstrate how we use light to measure brain oxygenation and metabolism at their first event of the year, the Meet and Greet! With over 120 participants, the room was filled with energy and enthusiasm towards modern technology used in the medical field, and we were delighted to scan over 20 brains on that day! We hope everyone had a great night, and found our research interesting! Hope everyone keeps an eye out for the rapidly developing field of Near Infrared Spectroscopy! An article highlighting metabolic monitoring and artificial intelligence has featured CYRIL! 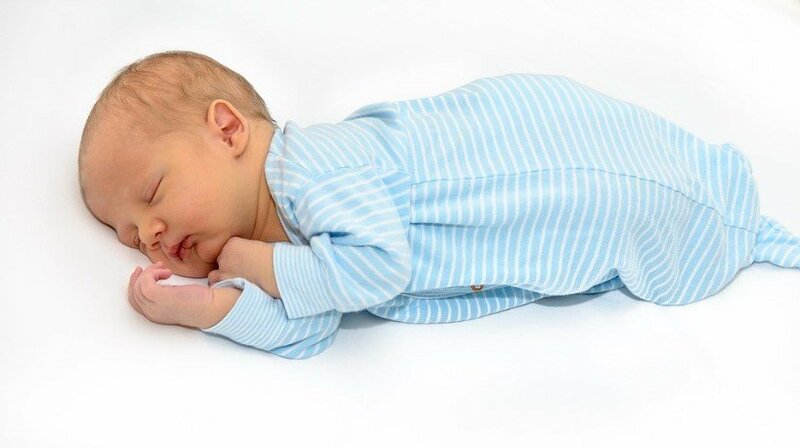 CYRIL can identify oxygenation and metabolism levels in the brains of babies, and uses specific colours of light that can penetrate human bone and tissue – red and infrared light. 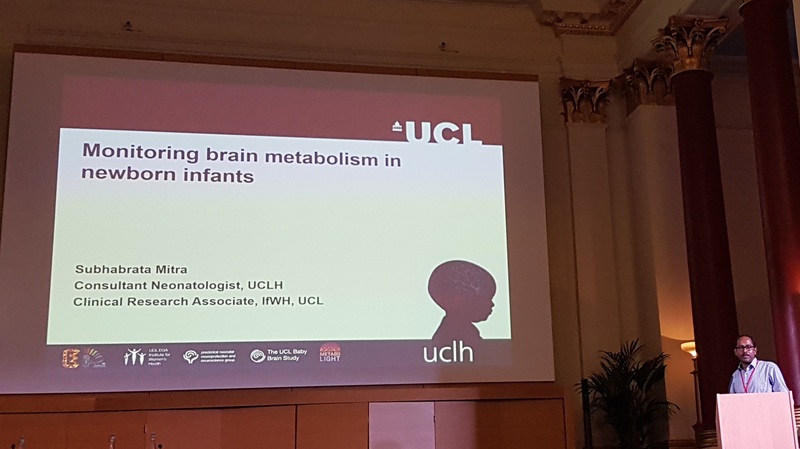 Our MetaboLight member Dr. Gemma Bale had recently visited the British Science Festival and demonstrated to a large audience how we use light to detect baby brain damage using CYRIL (CYtochrome-c-oxidase Research Instrument and appLication). Her talk attracted wide-range attention, including an article by British Science Association. We are honoured to be in a news article by BBC Health, highlighting our research and explaining how broadband near-infrared spectroscopy could help doctors with assessing brain damage earlier to ensure the best treatment method possible at the earliest moment. 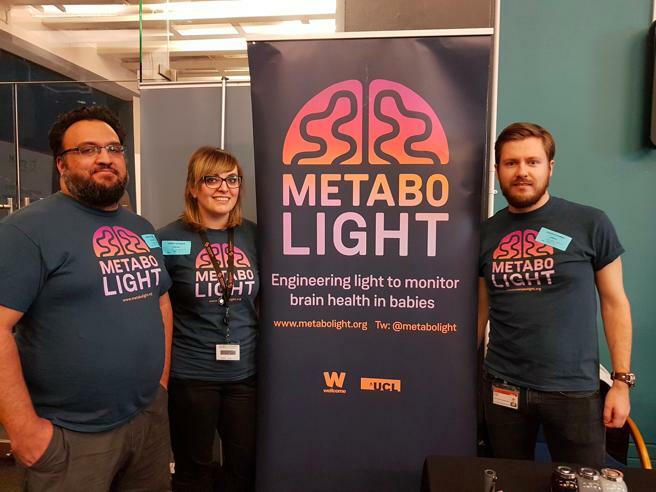 On Saturday 15th September 2018, University College London held the It’s All Academic Festival, with a range of talks, tours, workshops, pop-up events and interactive experiences – and MetaboLight was one of the highlights at the event! We had our brain scanner and hand scanner at the event, where we illuminated over 50 brains and scanned over 50 hands, and explained to curious people what we could do with light. The whole day was filled with science and technology, and we were exhausted yet overwhelmed by the positive feedback that we got from people who were interested in what we do and the clinical applications of Near Infra-red Spectroscopy. 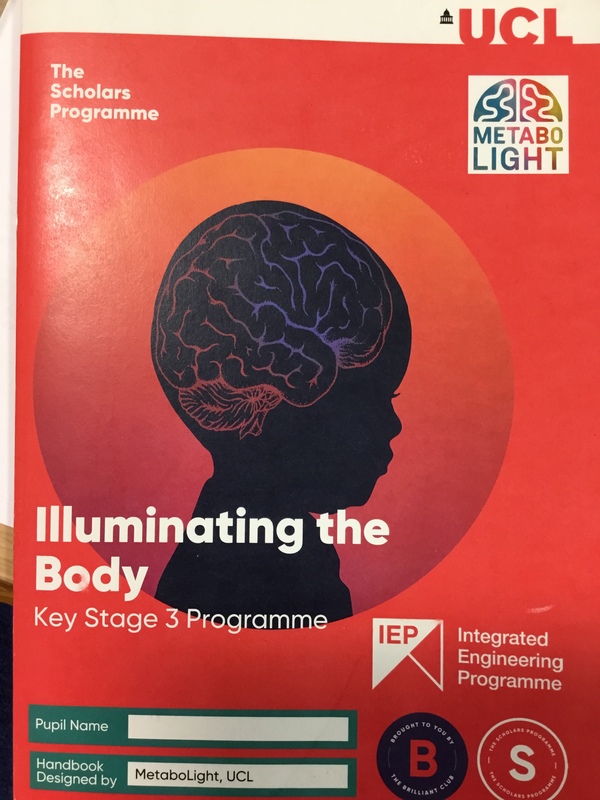 We are very proud to have had our researcher Dr. Gemma Bale share how our group uses red and infra-red light to monitor baby brains and give hope to the lives of affected families. Speaking at the British Science Festival in Hull on 13 September, Dr. Bale shared the science behind shining light into the skull of babies, along with the clinical applications and dramatic differences this technology has brought along. 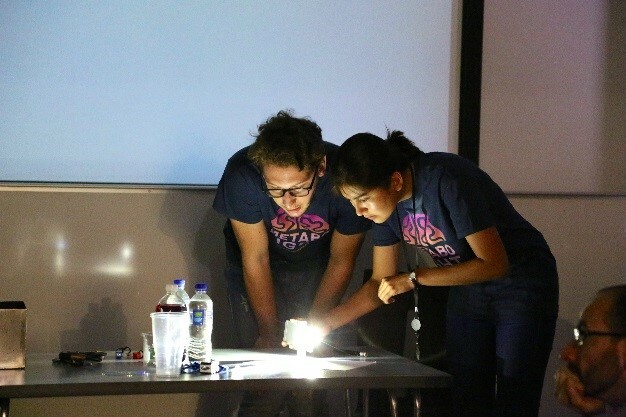 While passing around coloured LEDs to the audience and getting them to shine them at their fingertips, Gemma proved that humans are see-through under certain colours of light. A brave volunteer also came up onto stage to get her brain scanned, and her brain oxygenation and metabolism were projected onto the podium screen – at real time speed! The atmosphere was filled with excitement and promising eyes, as everyone was curious about what the future holds for near infra-red spectroscopy. The Institution of Engineering and Technology held their Engineering Open House Day on 3 August 2018 for young people and their parents to learn what it’s like to work as an engineer, and MetaboLight was invited to be part of the University College London Engineering booth to inspire people! We had a rush of enthusiastic youngsters interested in STEM pour into the hall, and had a blast explaining how we use certain wavelengths of light to measure brain oxygenation and metabolism. Some of the visitors were thrilled to see what this technology can do and how it has already helped save so many baby lives. We hope more people learn about Near-Infrared Spectroscopy and that more can benefit from this technology in the near future! My name is Bella and I’m 16 years old. I’ve just finished GCSEs and next year, I hope to study biology, chemistry, maths and further maths at A Level so I can go onto pursue a career in medical research. I contacted the MetaboLight team in the hope to gain some experience to find out what working life is like in a research lab. Upon first impressions, I felt welcomed into the department as I met many of the team’s friendly faces. I had the pleasure of spending the majority of my week with Gemma Bale, who showed me the NIRS device she had developed called Cyril. I spent most of the 5 days experimenting and using Cyril to monitor effects of occlusion of the arm including concentration of oxyhemoglobin, concentration of the enzyme CCO and hyperaemia over different time intervals. I was particularly impressed by Cyril’s ability to accurately measure many things about the patient non-invasively. Over the week, I learned not only how to use Cyril, but how to accurately record results and analyse the data. I also learned a lot more about the different types of medical imaging from NIRS to ultrasound, the process of metabolism and how to use lots of the lab’s equipment. In addition, I got the opportunity to sit on a panel of scientists where we gave feedback to a group of mature students who were pitching ways to educate people, particularly children and teenagers, on medical engineering. As the target audience for many of the pitches, I represented the teenagers by giving feedback and asking questions on their proposals. Overall, it was a really exciting opportunity and I feel very fortunate that I got to spend the week in the medical physics department. It has inspired me to continue to pursue my dreams to become a researcher in the future! I am an A-level student who has just finished year 12 and am studying maths, further maths, physics and computer science. Once I finish my A-levels I want to go on to study computer science or electronic engineering at university. My first impression was mostly how friendly everyone was. I was also surprised how all this research had been done by such a small team. I think I only saw 8 or 9 people my whole time there (maybe there were more and I am forgetting some people). On the Monday I met Ilias, he gave me a brief overview of what fNIRS was and how it worked, and also showed me a prototype for a new smaller version of CYRIL that was early in development. After this, Gemma and Isabel showed me the original Cyril and explained how it worked. After this Josh showed me some of the code behind the simulations that he had made. Then on the Tuesday I watched Zuzana do a phantom experiment with Cyril. The phantom was a tub filled with a blood-water mixture. This was used as it mimics the composition of someone’s brain. After this I started the investigation into the U parameter (metabolic demand) on the simulations. On the Wednesday Fred showed me a machine that is similar to Cyril except instead of measuring relative amounts of light going in and coming out it could measure the total number of photons in absolute terms. I then continued the investigation into the U parameter. Then on the Thursday I did more coding with Josh and finished the investigation into the U parameter. On the Friday I went to the Institute of cognitive neuroscience and Paola showed me a fNIRS headset that they use when they do the experiments out on the street. The thing that impressed me the most was all the equipment. I was also impressed by the fact that if they needed a certain piece of equipment or a piece of software they mostly made it themselves from scratch. I learnt so much as before I came I didn’t know anything about fNIRS or the anatomy of the brain but after I feel like a have a pretty solid grasp on how fNIRS works and I also learnt some of the anatomy of the brain. I don’t know what I plan to do next. Before I spent my week at MetaboLight I was pretty certain that I wanted to do computer science but the engineering side was so interesting that I am now thinking about possibly doing electronic engineering. 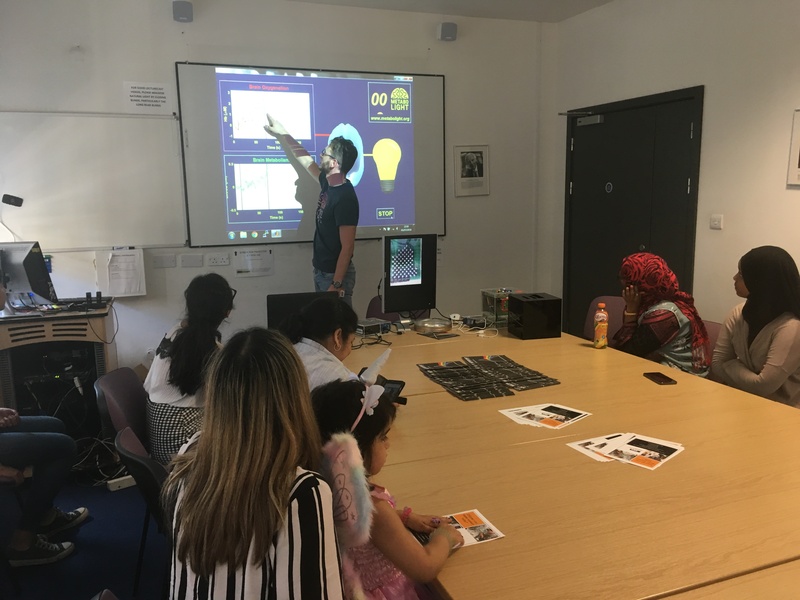 The MetaboLight team was thrilled to be part of an experience programme organized by UCL and Waltham Forest Virtual School to introduce higher education to children in care! The whole workshop lasted for 2.5 hours, starting with students playing around a “science circus”, where they could rotate around different stands and learn how light interacts with the outer environment. Then students had a hands-on experience in building their own electronic circuits through learning basic circuitry. They were remarkable and were able to build all circuits by themselves! Finally, students had a chance to see their brain scan, and were really excited to see each others’ scans! Overall, we enjoyed the session very much! We were even happier when helpers from the virtual school said that our session was the highlight of the 2-day summer school. We hope to help out in more of these activities in the future! 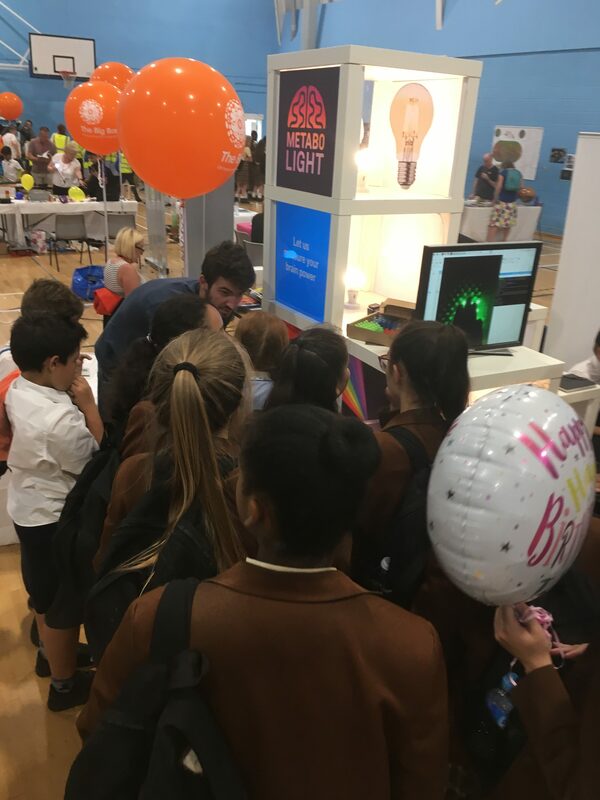 MetaboLight was overjoyed to be part of the London Regional Big Bang Fair at Sutton Grammar School on 13 and 14 July 2018! Lots of interested students from 38 different schools poured into the school halls on Friday, with an estimated of 2000 students altogether on that day. 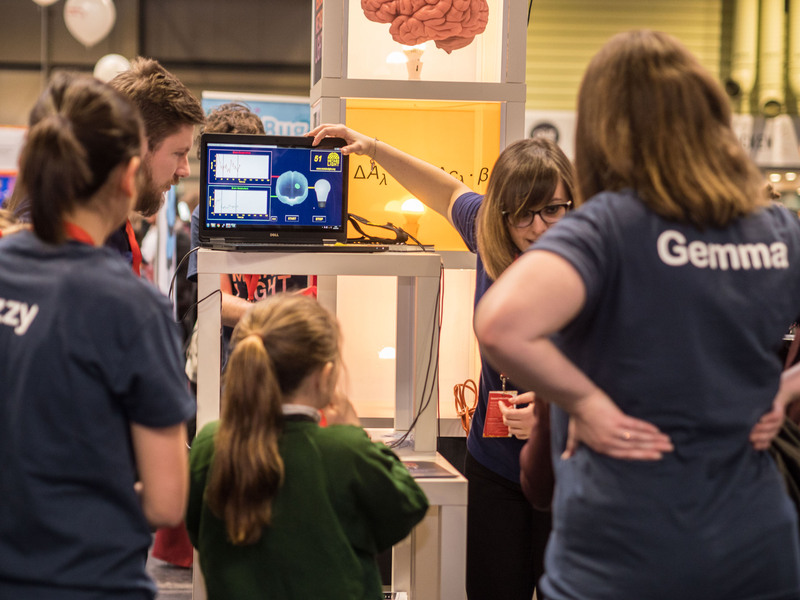 The hall was filled with a fun atmosphere full of science and technology, with everyone coming to our stand with enthusiastic interest in how we use light to measure brain power, and leaving with delighted smiles as they saw their brain activity and hand scans. Saturday was open to public, and we were more than happy to share our research with families and people from all backgrounds. It was a wonderful event, and we would like to thank Sutton Grammar School once more for organizing such a well-planned event! I will be talking about a particular biological stand that involved the volunteer to do mathematics. You may ask why? Well as soon as you sit down into the testing chair, you will have an oxygen reader strapped to a headband placed on your forehead. This measures your brain’s oxygenation and metabolism. This was very interesting and I got to improve my mathematics. I enjoyed this stand very much and I learnt that my brain takes in a lot of oxygen while thinking but very few of that oxygen is used. This has led me to take much more interest in the human brain and its functions. It is amazing. The MetaboLight team works hand-in-hand with University College Hospital (UCLH) as a unified group of clinicians, engineers and scientists. On 5 July, UCLH held its Research Open Day, where MetaboLight was invited to demonstrate how we use light for clinical purposes. 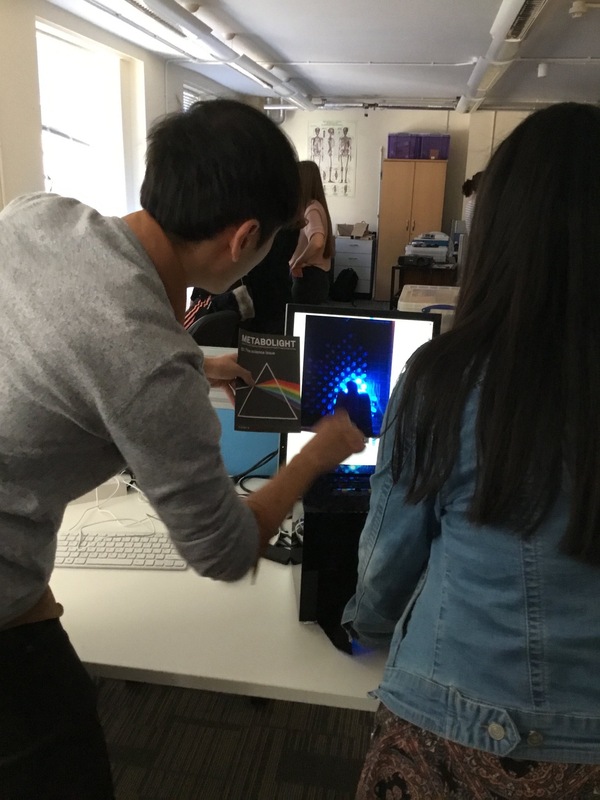 Groups of eager students came to UCL Department of Medical Physics and Biomedical Engineering to see our demonstrations – from understanding transmission properties of light with our hand scanner, to application of light to measure brain oxygenation and metabolism with our brain scanner! 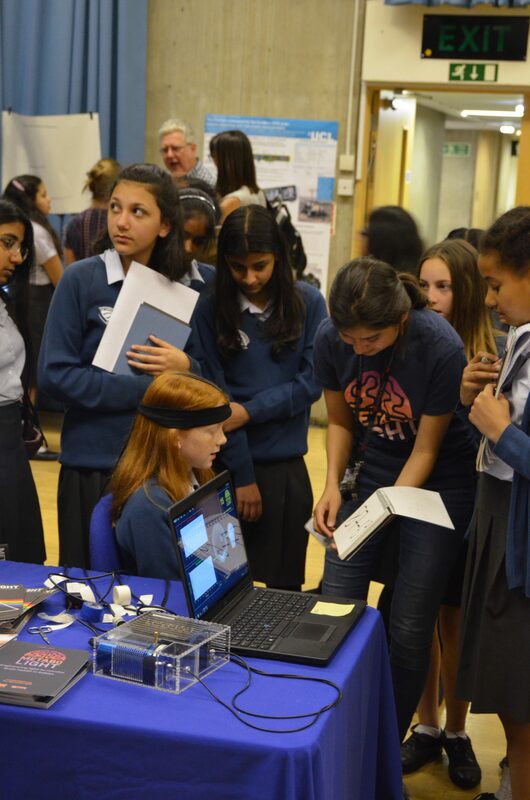 We were extremely happy to see the excited faces of the students when they could see their monitored brain activity! Great big thanks to UCLH for inviting us to this event! 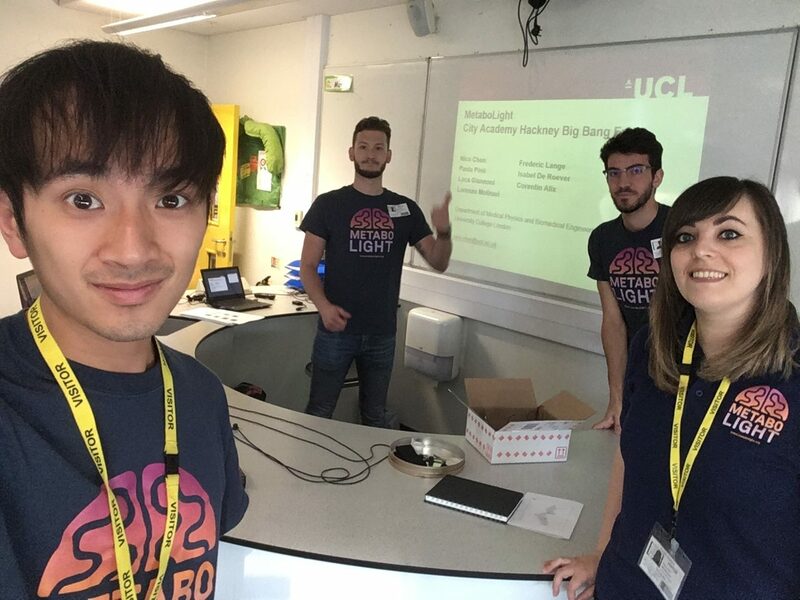 Our MetaboLight team was delighted to help out with the Big Bang Event at The City Academy, Hackney! We taught 6 one-hour long sessions, and reached a total of 123 students ranging from years 8, 9 and 10. The students were enthusiastic and enjoyed the electronics class that we had prepared for them. They learnt how to read electronic circuits and how to build an LED circuit where they could turn on the LED with a button and also control the intensity of the LED with a potentiometer! Finally, we scanned 12 of their brains and saw their oxygenation and metabolism increase when doing math tasks! The students were extremely excited to see the results of the brain scan! The Annual Teacher Conference was held on 25th June, and MetaboLight held an hour-long session for 25 science and physics secondary education teachers and inspired them with methods to carry out education regarding optics. This sparked discussion among teachers as they tried to pinpoint how and where they could use these workshops in the classroom with their students. Afterwards, we shared our life-saving research with them, introducing them to our research and instrumentation. The teachers were interested and fascinated with our technology, and were pleased with our efforts to help save baby lives! 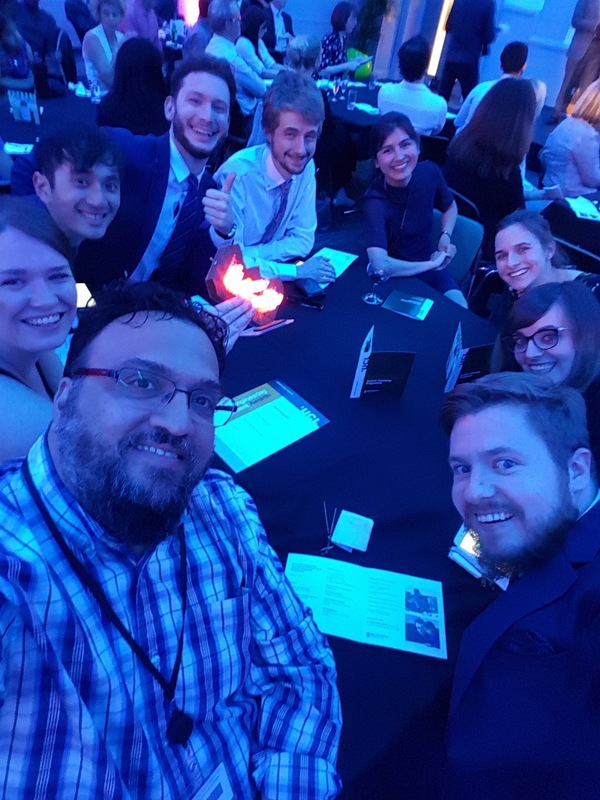 22 June 2018 was another busy day for MetaboLight – we were invited to help out in celebrating International Women in Engineering Day! We met many enthusiastic girls who were passionate about engineering, and showed them what engineers do and their significance to the society. We conducted hand scans with light that can penetrate through their hands – and many of them saw their blood vessels in real time! We also scanned some of their brains and measured their brain oxygenation and metabolism, which many girls found fascinating! We reached out to 114 year 12 girls that day – and hopefully will continue to inspire more people throughout the year! 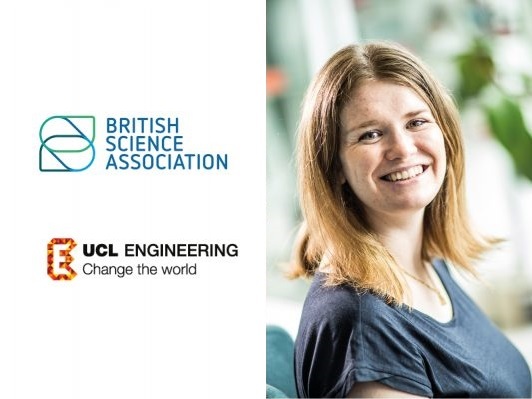 Our MetaboLight team member Dr Gemma Bale has been awarded The Isambard Kingdom Brunel Award Lecture for Engineering, Technology and Industry by the British Science Association (BSA) as part of its prestigious Award Lectures for 2018. As an Award Lecture winner, Dr Gemma Bale has been invited to the British Science Festival in Hull, where she will introduce her life-saving research to everyone! 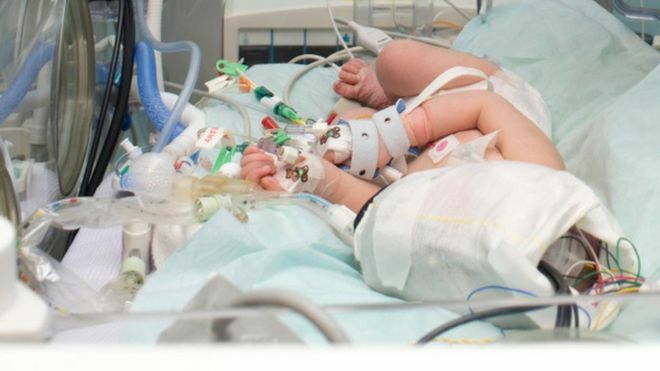 Dr Bale will discuss the hugely important topic of brain injury in newborns, which is a leading cause of infant mortality. She will also showcase her pioneering work applying an infrared light technique to monitor baby’s brains, which is giving hope to the lives of many affected families. We are overjoyed to announce that our team member Dr Gemma Bale has been awarded the BSA Media Fellowship 2018! The BSA Media Fellowships provide a unique opportunity for practising scientists, clinicians and engineers to spend two to six weeks working at the heart of a media outlet such as the Guardian, BBC Breakfast or Buzzfeed. We congratulate Dr Gemma Bale, and wish her the best in her research and public engagement activities! 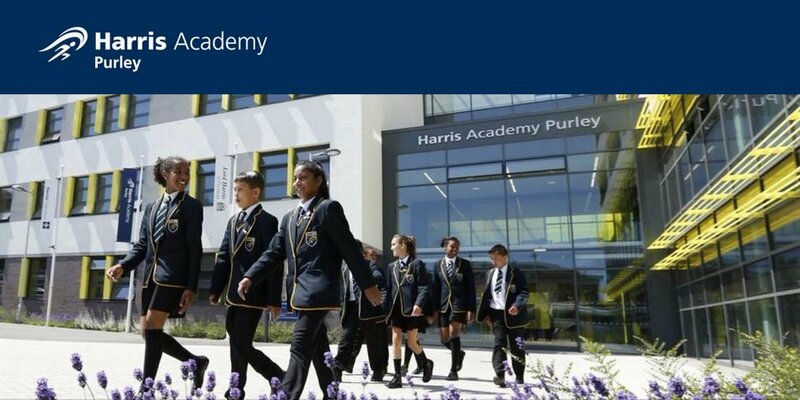 Research Associate Dr Gemma Bale, and PhD students Isabel de Roever and Pardis Kaynezhad have been working with the Brilliant Club to inspire talented Year 8 pupils from under-represented backgrounds to apply to study medical physics and biomedical engineering. In partnership with The Brilliant Club and UCL Engineering Education, Dr. Gemma Bale (BORL) has designed a six-week Key Stage 3 course, Illuminating the Body, for the programme to teach Year 8 students about the engineering design process, the application of physical principles to the design of machines, and how scientists interpret data. The course is being delivered by 31 tutors all over the country, reaching almost 400 pupils! Two PhD students from BORL are delivering the course, Isabel de Roever and Pardis Kaynezhad. 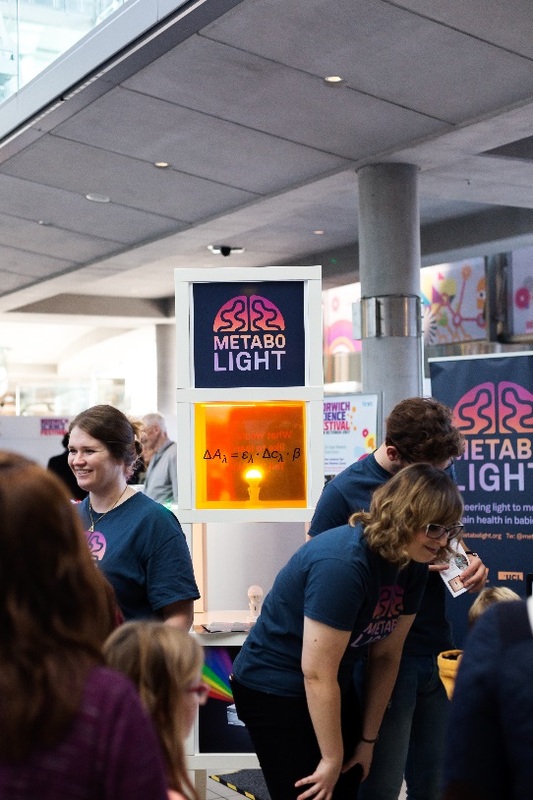 MetaboLight members were invited to exhibit at the Institute of Education to celebrate the International Day of Light with groups of young people enthusiastic about science and engineering – and light! Out of the 250 people that visited, we scanned around 20 brains and 40 hands in total, and the students were excited to see how their fellow schoolmates responded to mathematics questions and how this affected their brain activity! We also found out from a survey that everyone enjoyed their experience at our booth – and learnt a lot about medical physics and biomedical engineering after visiting us! We are overjoyed to hear that students from Tiffin school loved our brain scan exhibit – so much that they are preparing a presentation to teach other students about it! It is brilliant that our way of using light to measure brain activity will be shared with 400 more students! 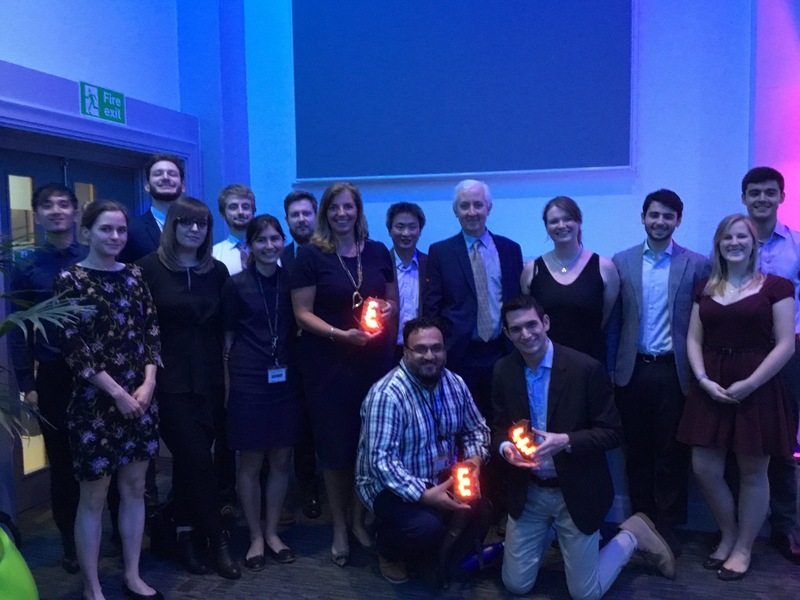 On 8th May 2018, MetaboLight was awarded the Best Research Group at the Provost’s Engineering Engagement Awards 2018! We are delighted that our research and public engagement has brought along so many positive impacts and that we are getting recognition for our hard work! We look forward to continuing our research and bringing an even bigger impact on lives of not only babies, but aspiring engineers and everyone around us! On a Wednesday evening in Henley, Gemma gave a talk and live demo at a local Café Scientifique to over 80 science enthusiasts. Gemma talked about near-infrared spectroscopy (NIRS), how we use light to monitor the brain and then demonstrated this live on an unsuspecting member of the audience! With our NIRS system taped to his forehead, Gemma monitored his brain oxygenation and metabolism levels while he was doing mental arithmetic. 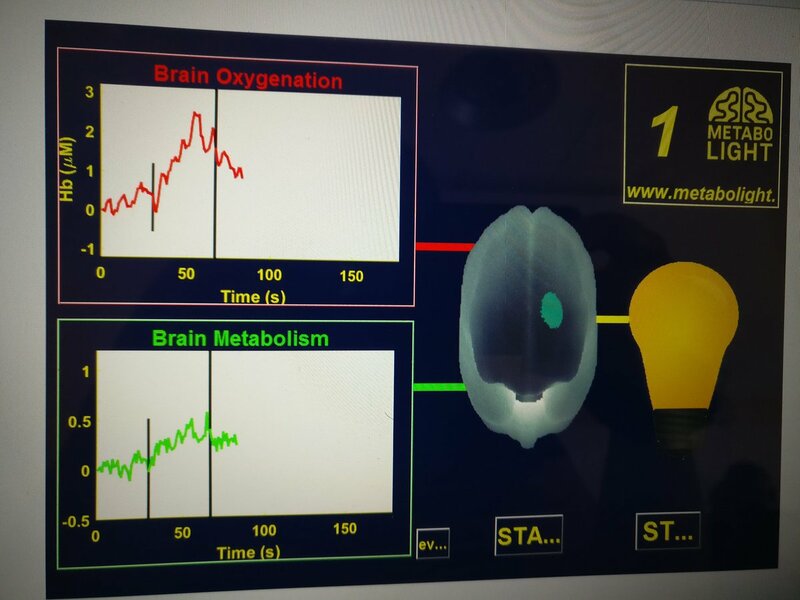 As you can see in the picture, as his brain was working on the maths there were huge increases in his brain oxygenation to feed the increase in brain activity, as can be seen by the increase in brain metabolism! After the live demo, the audience overwhelmed Gemma with interesting questions and ideas for future experiments. Finally, Gemma ended the night by giving an overview of the research happening in the hospital to monitor brain injured babies using NIRS. 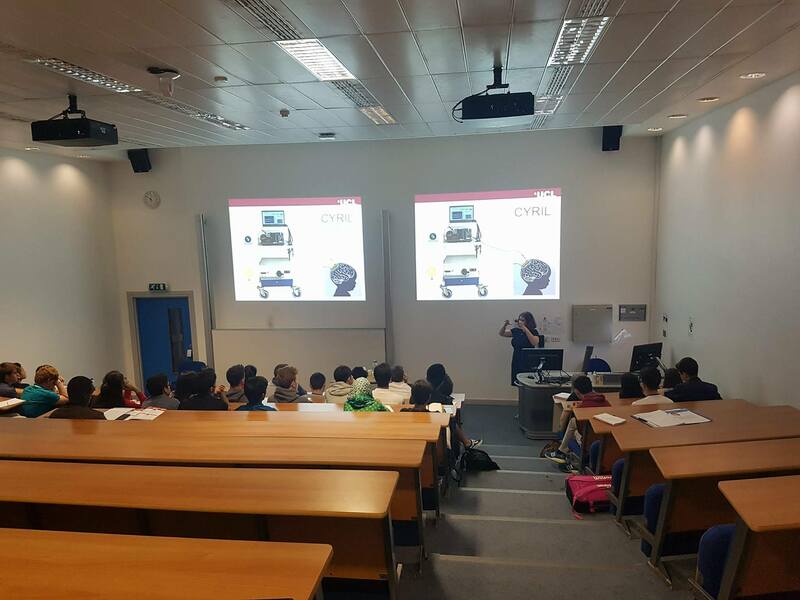 Our researcher, Gemma Bale, has been giving lectures across the country to inspire future physicists at Physics in Action days. 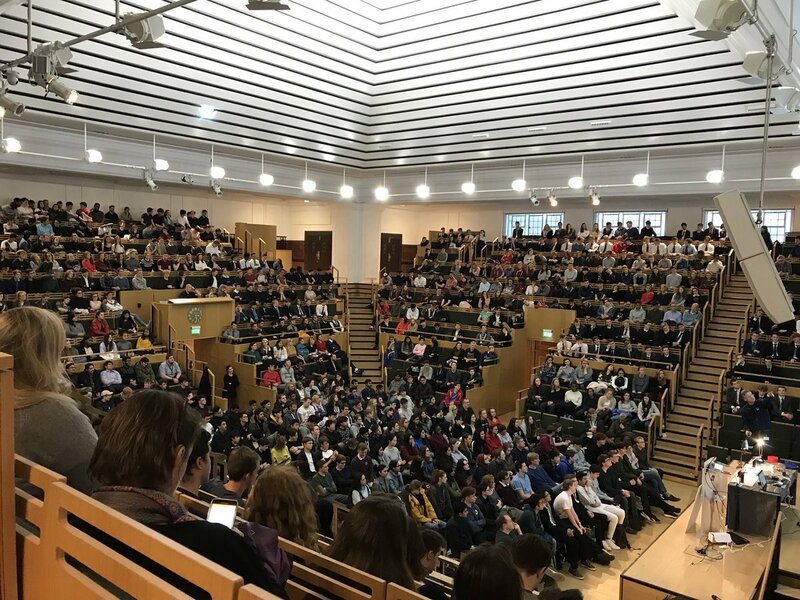 Held at the University of Warwick and in London at Friend’s House and Camden Centre, Gemma has talked about her work in developing technology to monitor babies’ brains with light to over 2000 A level students! The lecture includes creating an optical model of the brain using milk and cordial, getting everyone in the audience to shine light through their hands with their phone torches and a look into the future of medical devices. 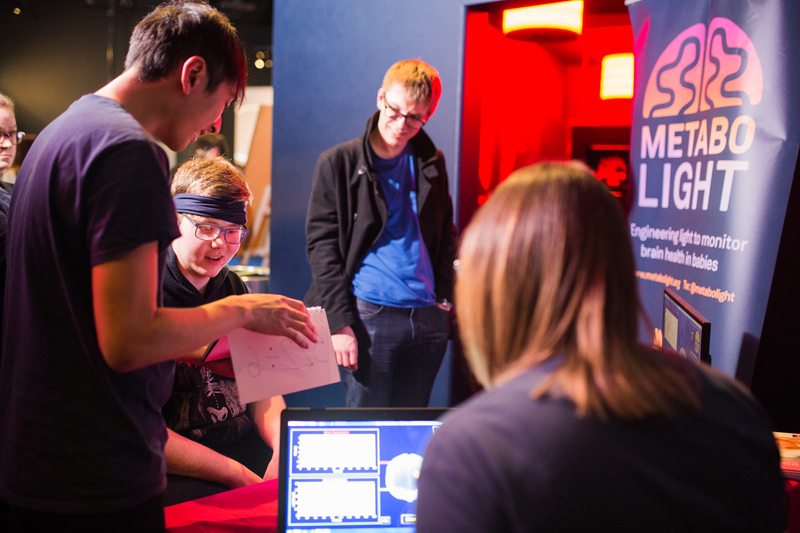 The MetaboLight team went to Birmingham and took on The Big Bang Fair; the largest celebration of science, technology, engineering and maths (STEM) for young people in the UK. An event with foot traffic of between 8,000 and 10,000 people each day. We were very pleased with the opportunity and we can confirm now that this event was a major, but enjoyable, challenge for the whole team. Our interactive exhibit helped a lot in bringing in the crowds and our three main activities of (1) Guessing the gummy bear colours; (2) Making your hand invisible with near-infrared light; and (3) Measuring your brain activity; were a success. In fact, we made more than 300 hands invisible, measured the brain power of more than 300 brains and gave away more than a couple of thousand gummy bears. One of our main activities this time was the hand scanner, a device that people place their hands in and using near-infrared light we demonstrate to them how their hand becomes invisible. 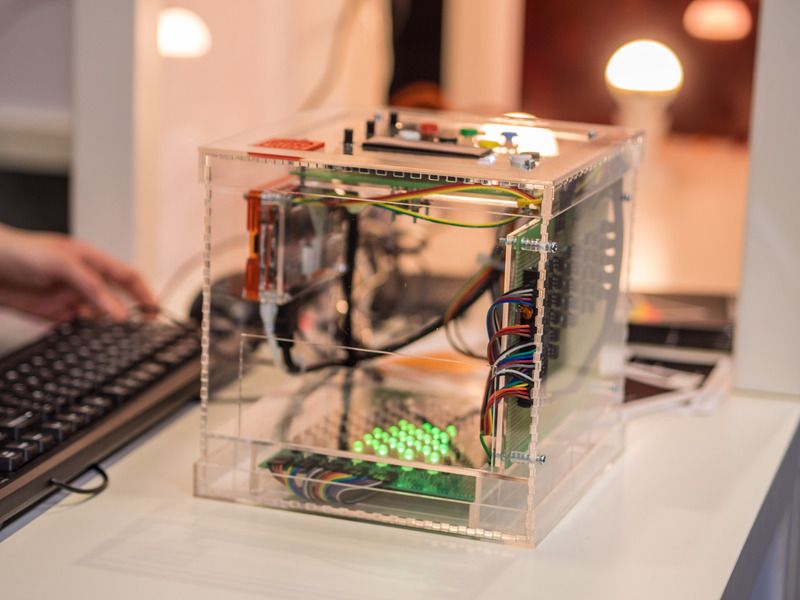 This device was put together by our resident medical engineer Nico Chen using various LEDs (light sources), a very sensitive camera that can see near-infrared light and a Raspberry Pi (a small computer). It was literally a “hands on” activity illustrating how different colours of light pass through tissue and how near-infrared light can penetrate through bone. 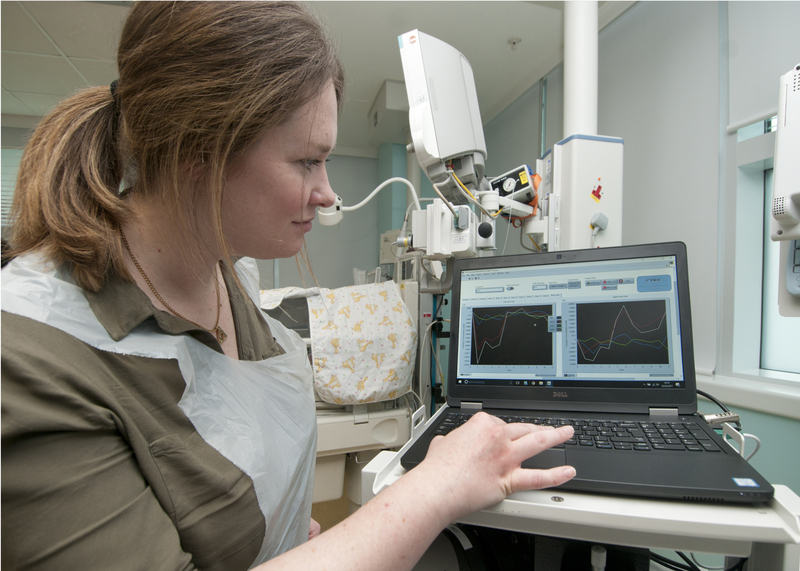 We use near-infrared light in our research to look into the brains of very sick newborns in the intensive care unit and quantify their levels of brain oxygenation and metabolism; information that medical doctors can use to treat the infants. We would like to thank everyone that came to see us in The Big Bang Fair and importantly the people that did our activities and asked a lot of questions! Two of our MetaboLight team members went to the National Science and Media Museum in Bradford to give a talk and demonstration on how we use near-infrared spectroscopy (NIRS) to monitor the brain! People from all across Bradford came and visited our stand, with around 200 visitors over the 3 hour demonstration period. We managed to illuminate over 20 brains, and many visitors were fully engaged and interested in our explanations on how our compact system works and how this technology is being used to save lives of babies. Our researcher, Paola Pinti, also gave a talk describing how light interacts with the environment, and how we use its properties to monitor the brain. She also gave insights from her own research projects, and fascinated audiences with the capabilities of this technology. It was a fun day – hopefully we inspired more people to become scientists and engineers! 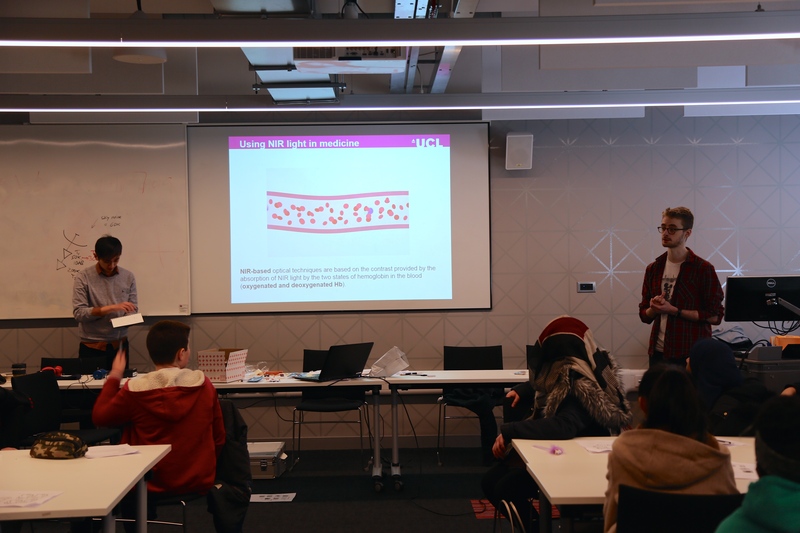 Two of the Metabolight team recently hosted a session as part of UCL’s “Engineering Saves Lives” Masterclass series. 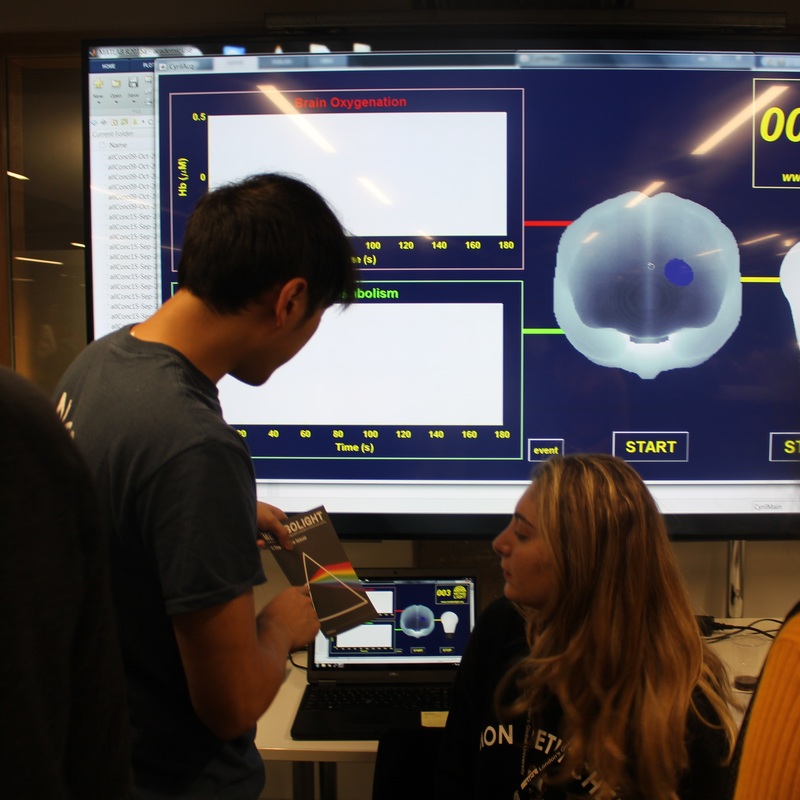 Students from all across London came together to learn about how our team use light to explore the brain. The day started with a short presentation on our work before moving on to the “science circus”. Four experiments were set up to explore different aspects of light and the brain, with students moving between experiments after ten minutes. Experiments ranged from using a model of metabolism in the brain to look at its function through to shining light through different materials to try and light up a sensor. After a short break, students then took part in an electronic engineering tutorial led by Metabolight’s resident engineer, Nico Chen. 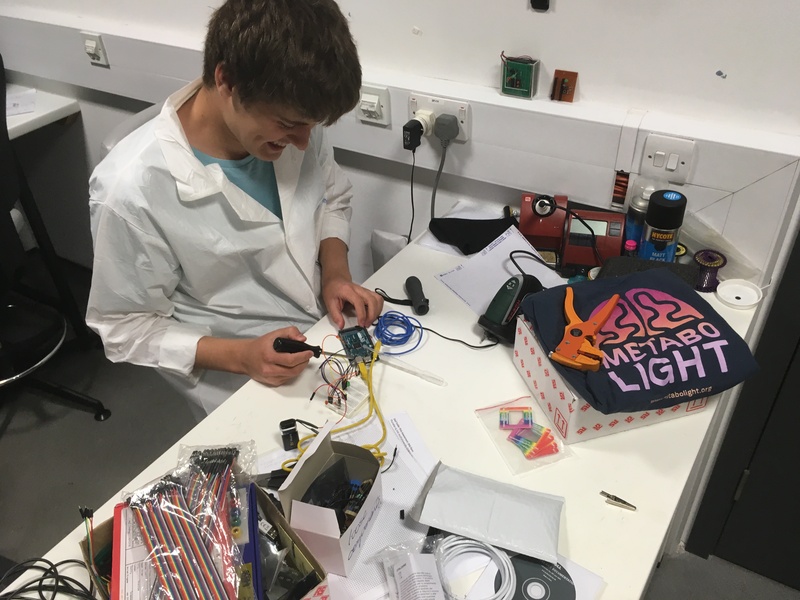 From simple circuits that light up LEDs through to more complex ones that used different combinations of switches, all the students really enjoyed the chance to get hands on experience with part of our work that we don’t often get to talk about! We finished the session by looking at the kind of machines we use in a clinical and research setting before then getting a few of the students up to the front to live stream their brain’s haemodynamics using our mini CYRIL device. All in all, it was a great day with both our team and the students taking a lot away from the experience. We’ll be posting materials about the experiments we developed for this session in the near future! Our team at MetaboLight had an exciting afternoon on 9 November at the Natural History Museum where we shared our work with teachers. The event was organized by STEM Learning and the Natural History Museum, and aimed to assist and inspire teachers in creating and delivering science to their students in fun and exciting ways. We prepared some nice experiments that can easily be reproduced in classrooms, shining various coloured lights through different liquids to demonstrate light interaction with matter at different wavelengths. We also showed teachers how a normal smartphone can monitor heart beat rate using the same principle! We spoke about our research work to lots of people and saw a lot of interest in our demonstrations from teachers! Hopefully we helped them to inspire their students to become scientists and engineers! On 25 October, our team at MetaboLight went to Norwich Science Festival to share our work with others! Norwich Science Festival took place over a week-long period, and we were lucky enough to be involved with this event for one of those action-packed days. With foot traffic of between 8,000 and 10,000 each day, we were in for a busy time! We got to show off our interactive exhibit that was first presented at our launch event, as well as share our work using light with the many festival-goers. The highlight of our exhibit was using one of our compact systems to monitor brain activity. We recruited volunteers to do some mental arithmetic sums whilst we monitored their head using light. With increased brain activity, we expect to see an increase in blood flow as our brain cells need more oxygen and glucose to generate energy and we can measure this increase in oxygenated blood using near-infrared light. We saw some great results from our volunteers. It was an eventful day – we spoke to lots of people, monitored lots of brains (over fifty) and hopefully inspired some future scientists and engineers! How can we explore the oxygenation of the brain? That’s one of the questions that near-infrared spectroscopy could answer. 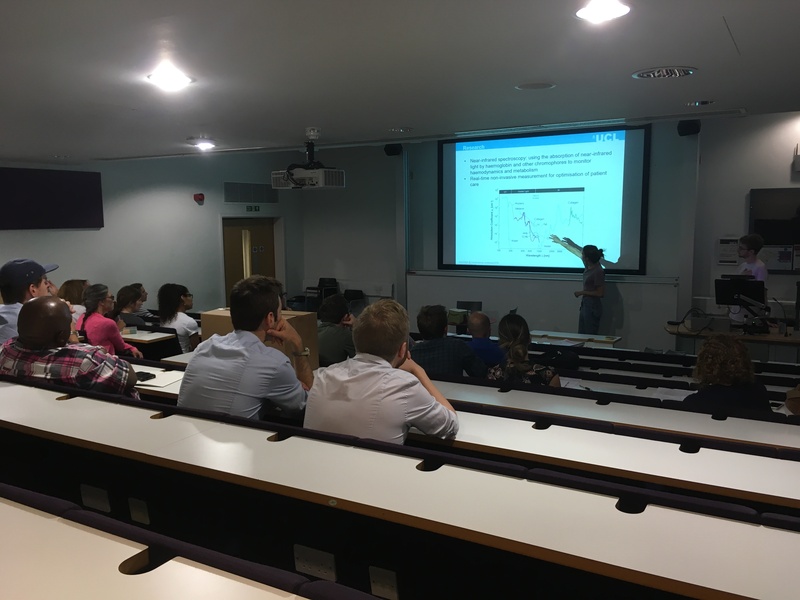 On Monday 7th August, Dr Gemma Bale presented a specialist lecture to the London International Youth Science Forum at Imperial College London to a group of young scientists from all over the world. The lecture covered the function of the brain, how near-infrared light can monitor changes in brain activity, and how it could be used to save lives in the future. The lecture began with Dr Gemma explaining how near-infrared spectroscopy works and went on to show how she uses her equipment to monitor brain injury in newborn babies. After this, with the help of a volunteer from the audience, she made an optical model of the brain (made of water, food colourings and milk) and showed how infrared light interacts with it. At the end of the session the participants were allowed to ask questions and had an interesting discussion with Dr Gemma. They said thanks for the amazing lecture, mentioned how important this investigation is, and how this could change people’s lives. They also mentioned how much they enjoyed the lecture and we hope that she comes back for LIYSF 2018! On 4th September, members of the MetaboLight team visited Year 12 students in Newham College, East Ham, as part of their Induction Day welcoming them back to the start of the school year. 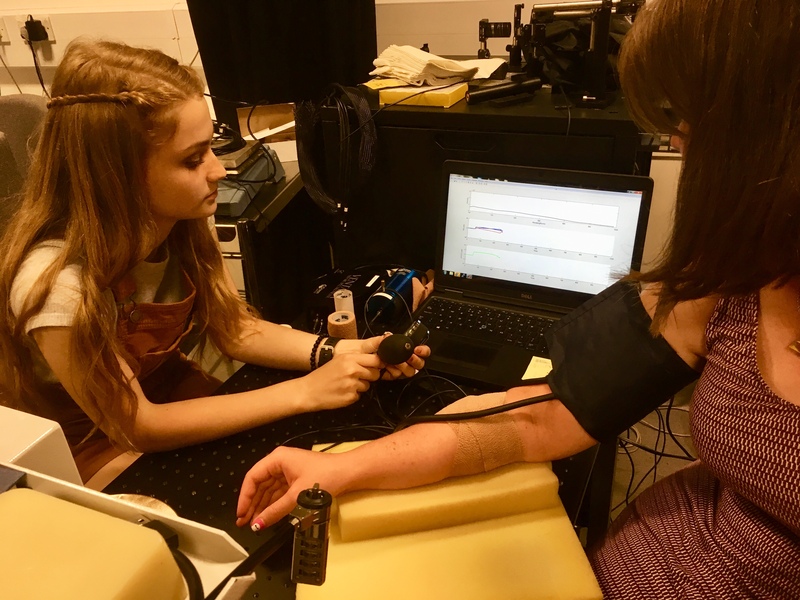 We hosted a workshop to introduce students to the topic of Biomedical Engineering, including the work we do using light to investigate physiological changes in the body. Demonstrations included looking at absorption and scattering effects using cordial and milk, shining light through our fingertips, and asking a few brave volunteers to perform a maths task designed to activate their frontal lobe, whilst we monitored their brain activity! We had a fantastic time sharing the work we do with this inquisitive group of students, and were pleased to see their enthusiasm and enjoyment during the session. We wish them all the best for their continuing studies! On Friday 28th July, talented young scientists from all over the world, taking part in the annual two-week LIYSF event, visited UCL to learn more about science research and its applications. 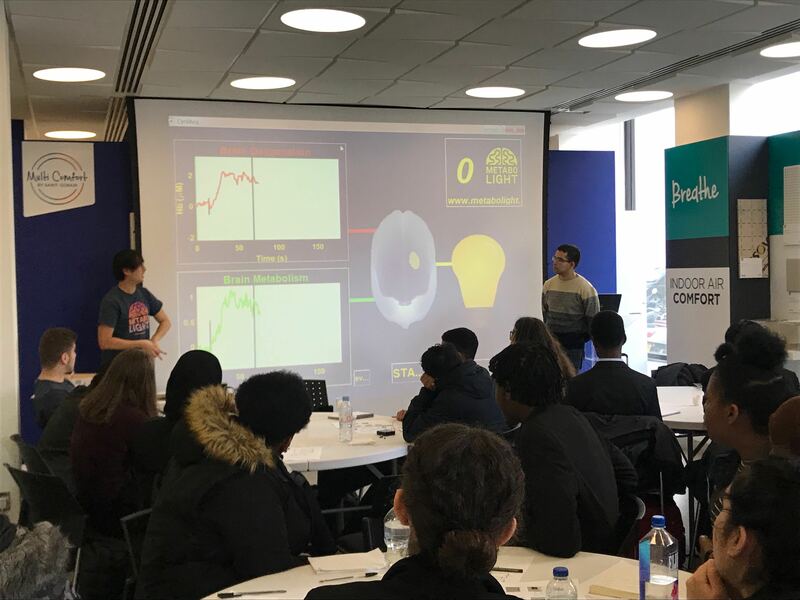 The team at MetaboLight hosted a workshop for 30 Year 12 pupils to show them the research we are doing and how simple principles they have learnt in their science lessons can be expanded to our work. The workshop began with an introduction to the brain, before demonstrating how we can harness the different properties of light to interrogate biological tissue and how the light coming back can be used to obtain information about oxygenation and metabolism in the brain. This all lead to guiding the students to building their own near-infrared spectroscopy (NIRS) machine and the culmination of the workshop was in a functional brain experiment. 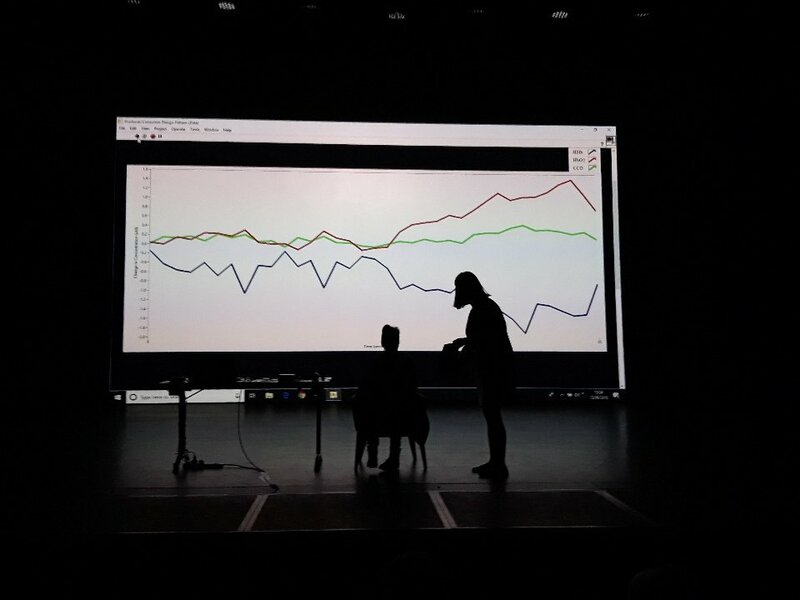 We used one of our commercial NIRS systems to monitor the frontal lobe of one volunteer – and as they performed a maths task, we could see a clear increase in brain activity! Success! We thoroughly enjoyed sharing our work with an excited young audience and wish them the best for the remainder of their program! 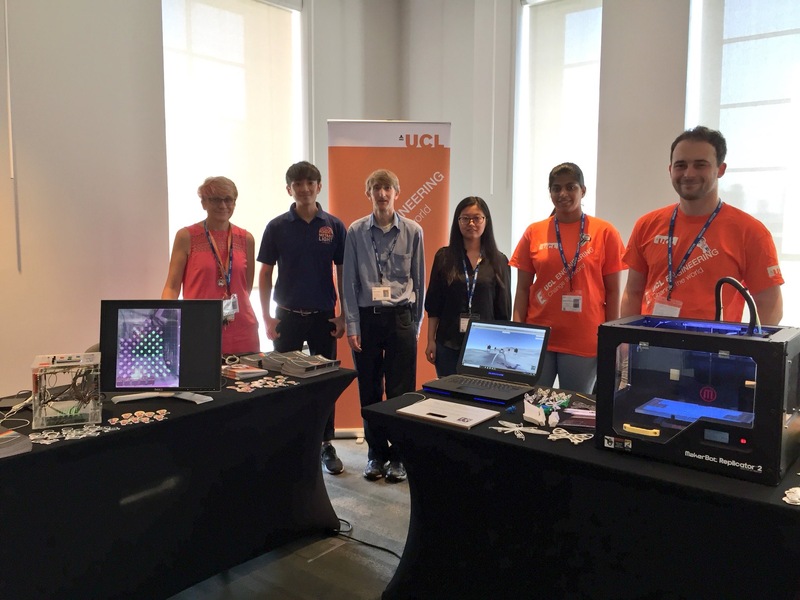 This year’s annual Institute of Physics Teacher Conference took place at UCL, and our team at Metabolight were keen to get involved! We held a workshop for the teachers to share our work and help relate real-world research back to the classrooms. We started the workshop introducing the basic principles of white light, before imaginative use of gummy bears and different coloured ‘finger LEDs’ helped to demonstrate concepts such as absorption and reflection. Next, we got interactive! We asked the teachers to get out their smart phones and shine the white light from their camera flash through the tip of their finger, to demonstrate how red and near-infrared light can travel through tissue (including bone). Finally, we introduced the pulse oximeter, a medical device which utilises the same concepts we use in our research. We concluded with some examples of the optical systems we are building in our team and how these are being used in the hospital to monitor brain-injured babies. It was a great experience sharing our work with such an engaging audience, and we hope to get involved with more of these workshops in the future. 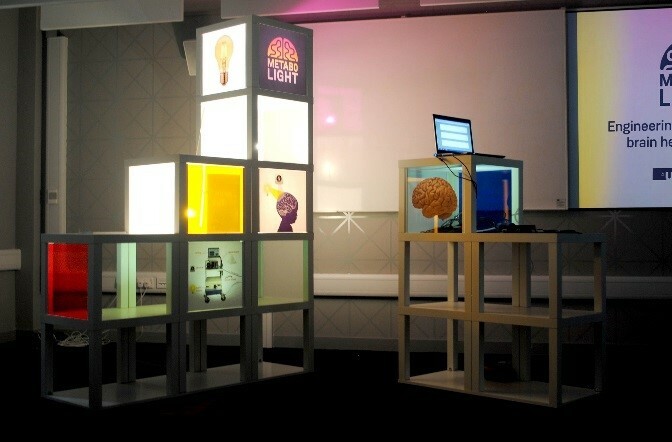 Wednesday 12 July saw the much-awaited launch of our public engagement project, MetaboLight. We were very excited to finally introduce this collaboration between scientists from UCL and doctors from UCLH to the public. The evening kicked off at 1700 with some welcome drinks and the unveiling of our interactive exhibit (see picture), which will be rolled out at science festivals in the future. We then presented our branding and website design, before the premier screening of our short film explaining what our research is all about. We really enjoyed the evening and received some great feedback to help us continue developing and expanding our project. We are now very keen for the next steps of our Metabolight journey – watch this space! 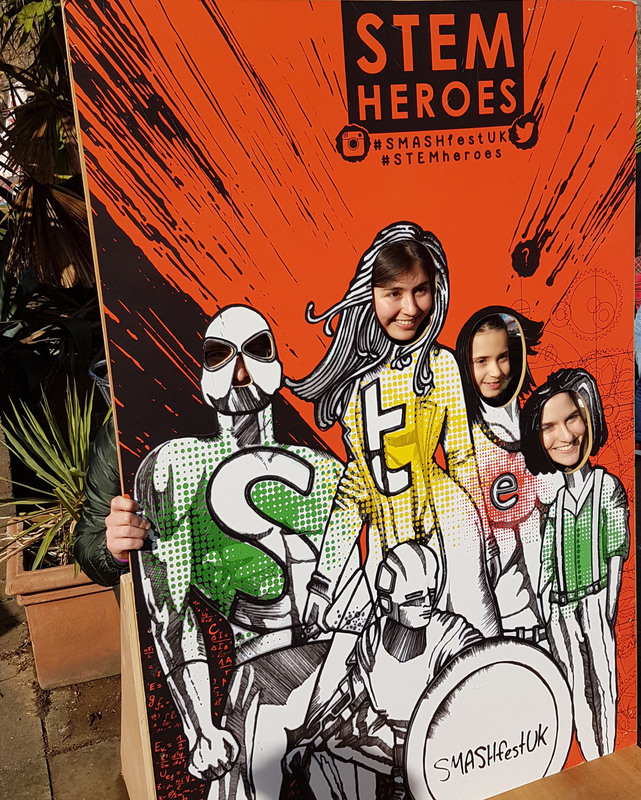 On 17 February we visited SMASHfestUK, a Science, Engineering and Arts Festival in Deptford, London. The aim was to explore a local science festival to help prepare for our public engagement activities and be inspired! Located in the nearby area of Deptford, only a stone’s throw away from UCL, we set off to discover the wonders (and horrors) of the supervolcano that was about to erupt at the festival. From volcanic rocks to survival tactics and navigating robots, all aspects of natural disaster were investigated. It was a fun field trip, with some great interactive exhibitions and thought-provoking activities. It has certainly given us plenty of ideas for our future engagements!